Although it may not look like it, it is officially spring. We are at the beginning of the season filled with fun activities, outdoor adventures, and rain and mud and lots of clean-up to do! When the snow melts, it often reveals a mine-field of poop in the yard, and unless you want it all over your dog, your shoes and your house, you need to get out there and clean it up. The best way to dispose of dog poop is to bag it and dispose of it either in the garbage or compost (if your city allows that). With so much to pick up all at once, I’m sure we all want to make the smallest environmental impact possible by using poop bags that will break down, or that we can throw in the compost. Earth Rated original poop bags are available unscented or with a pleasant lavender smell and will biodegrade in a landfill in 24 months. Also available are the Earth Rated compostable poop bags that are made with 100% corn and are very durable despite the thin eco-friendly material. The Canadian company operates a zero-waste factory where there are no scraps – all bag scraps are reworked into production. Earth Rated gives us the best of all worlds with environmentally friendly products that are tough enough to stay between fingers and feces. Even after all the waste is picked up out of the yard, it’s still a mess! Mud is inescapable this time of year, so we are left just having to deal with it. We’ve all done the baseball catcher stance, towel in hand, trying to grab hold of our dogs or cats as they run in from the yard, soaked up to their bellies in dirt. The mud saturates their fur, gets in between their toes and they are most impatient with us as we wipe, rub and pick at them in the doorway. There must be a better way! As it turns out, there is a better way. Let’s be real, it’s never going to be easy or fun but it can be much less frustrating if we just have the right tools. Your everyday hand towel or even bath towel is no match for our messy mutts. Thankfully, Messy Mutts really gets it and has created products that put up a good fight against dirty dogs and crusty cats. 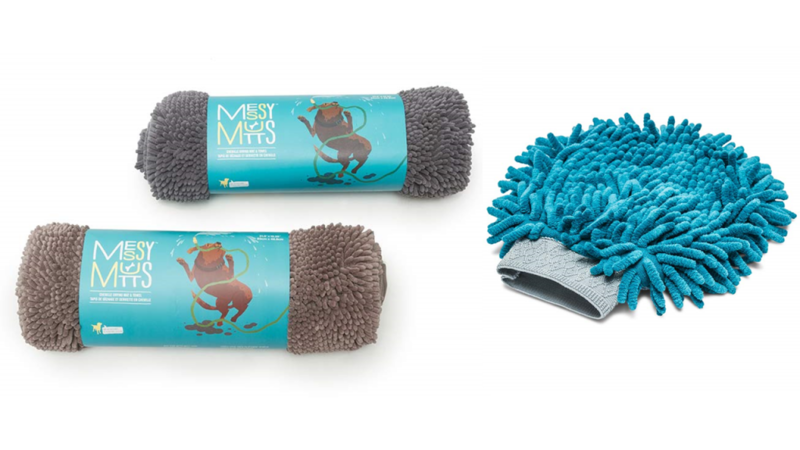 Arm yourself with microfiber matts, mitts and towels that hold 7 times their weight in water, and then you’ll have a chance at winning the fight against filth. For scrubbing betwixt the toes, a towel or mitt is not your best tool – for this you need the Dexas Petware MudBuster dog paw cleaner – add a bit of water and the soft silicone bristles gently and effectively scrub all the nooks and crannies of your dog’s feet. The clean paw then just needs to be dried off with a towel and your floors are saved. Although there are obvious struggles that come with spring, it really is an exciting time of year. We are all itching to get out and do things, and now we finally can! We can shed our parkas, double layered gloves and heavy insulated boots. We can go on adventures and do activities, any excuse to be out in the fresh spring air. 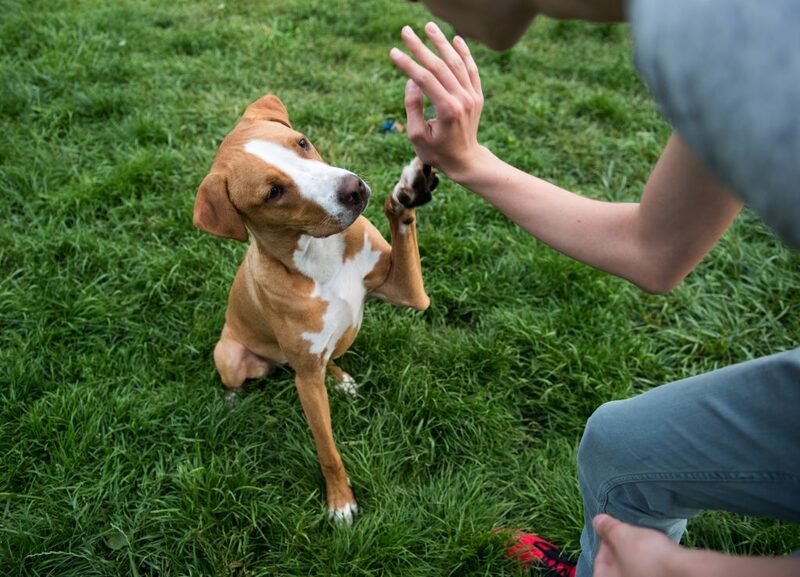 Your dog will love to go out in the yard or down to the park to play with all the new interactive toys you will bring home from your next visit to Global Pet Foods! 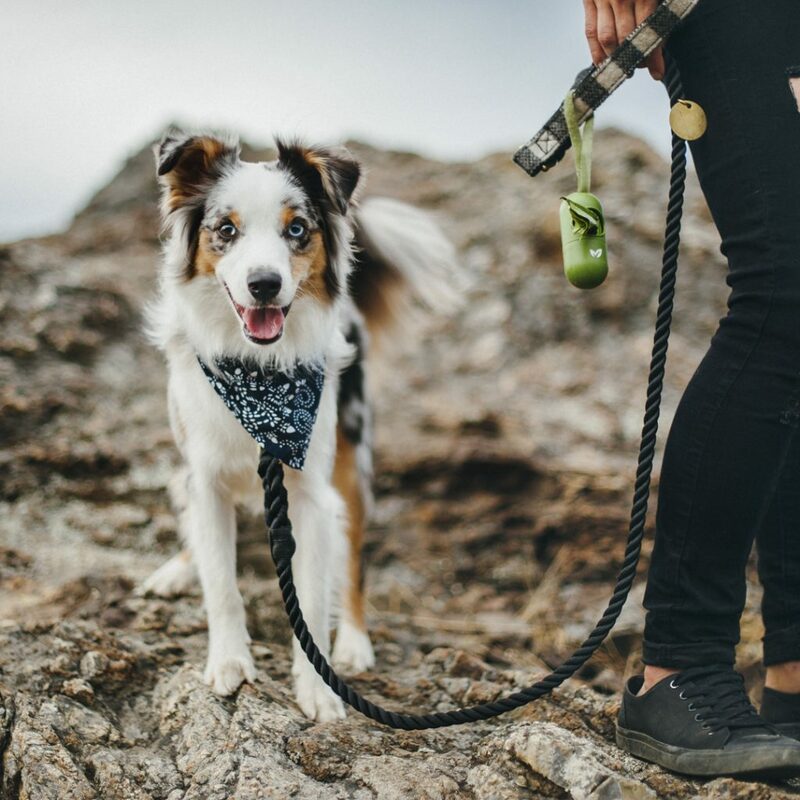 Balls and frisbees for fetch, ropes for tugging and floating toys for swimming; plus, all the gear you need for your escapades – leashes, collars and harnesses, treat pouches and poop bag dispensers. Maybe this spring you and your pet are taking on new challenges. Perhaps you signed up for agility or rally obedience classes or have decided to teach your cat how to skateboard! A new training challenge calls for tasty training rewards. There are all kinds of soft and chewy treats at Global Pet Foods that have a taste and texture that is super motivating and they are easy to chew and consume so they won’t distract too long from the task at hand. Find the perfect training treat for your pet and feel confident that they are healthy and nutritious! If your style is more relaxed and you just want to spend time outside enjoying the fresh spring air with your pet, hanging out in the yard, you can find everything you need at Global Pet Foods. Pick up a tie out harness for your exploratory cat, or a cot for your tranquil dog. Toys and treats for chewing help your pet relax and relieve stress. No matter what you like to do with your pet, this spring you can find all the essentials at Global Pet Foods. When it comes to deciding how to feed our pets, we make it our mission to find a formula with the highest quality ingredients, in the right form for our pets – whether it be kibble, raw, freeze dried or canned. We heavily research the company that makes the food and the regions from which they source ingredients. We watch our pets closely on each new formula, assessing their energy, weight, coat condition and stool quality. We become dietitians, dermatologists and gastroenterologists all in the name of love – for our animals. We love to see them wag their tail and lick their lips, shake a paw and get up on their hind legs dancing in joy! We want to thank them for being our companions, confidants and cherished friends with the most delicious, tempting treats we can find! But treats don’t just have to be delicious. “Treats” can become part of the diet that you have so carefully chosen or maybe even cooked up yourself. Considering treats, not just as a tasty morsel, but as a functional part of the diet, you can ensure the health of your 4-legged family members is always optimized. 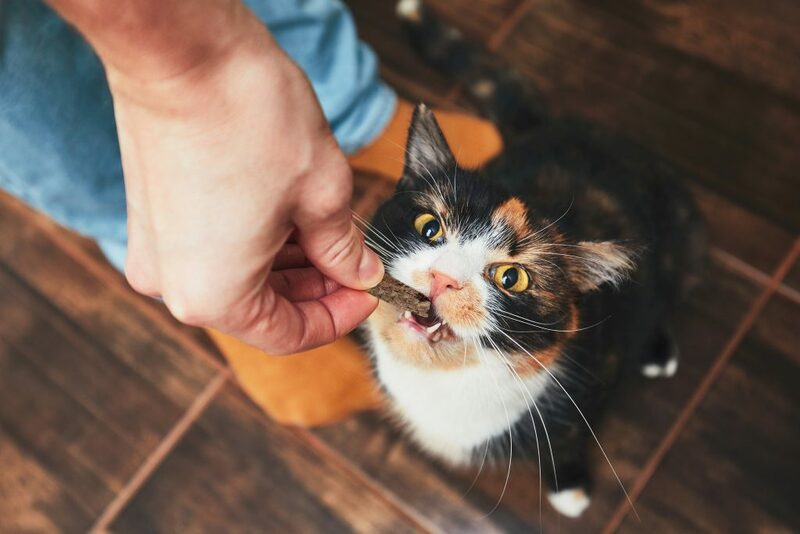 Lots of pet parents are already making a great effort to choose healthy treats, but it is possible to go even deeper and choose the right treats for what your pet specifically needs – a treat that is the perfect complement to the pet food you have chosen. Single ingredient treats are a simple addition that you can be confident in selecting. Only one ingredient means you have complete control over what you are adding to the diet. If your pet has dietary restrictions, it can be a hassle reading through the list of ingredients in many biscuits or chewy treats. There is a wide variety of single ingredient treats including meats, fruits and vegetables. Dogs love the taste of liver, so liver treats are a highly motivating reward. Not only are they delicious, they are high in protein, low in fat and a rich source of vitamin A – essential for skin & coat, eyesight and mobility; and B vitamins – essential for the function of multiple body systems, including energy generation, immunity and gut health. Chicken jerky is also a tasty, lean protein treat that contains B vitamins and Selenium – an important antioxidant. These treats are a great choice for weight conscious pets or pets that would benefit from extra protein or vitamins. Fish skin is a high-quality source of omega fatty acids as well as other nutrients that support skin structure and function including B vitamins, selenium and amino acids. Beef fillets also contain omega fatty acids as well as zinc, a very important mineral for skin and immunity. These treat options are healthy and tasty for pets that need dermatological and immune support. Many vegetables contain essential vitamins and minerals as well as complex carbohydrates that help regulate blood sugar and provide prebiotic fiber to enhance gut health. Air dried sweet potato is a palatable, low calorie treat that is low glycemic with fiber to support digestive health. Sweet potato contains vitamin B6, which also helps regulate blood sugar as well as support the nervous system and many other body functions. Vitamin C and manganese in sweet potatoes are both involved in antioxidant activities in the body. With so many nutritious treat options, you are able to complement and enhance your pet’s diet with the most suitable additions, while enjoying quality time bonding with your pet. 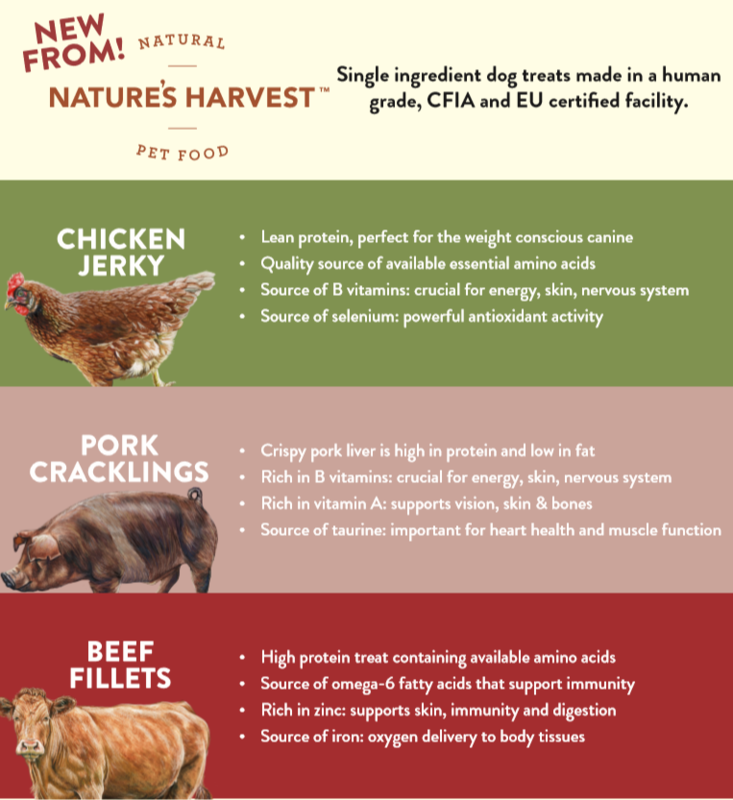 This month at Global Pet Foods we are highlighting three new single ingredient treats from Nature’s Harvest: air dried Chicken Jerky, Beef Fillets and Pork Cracklings. Crispy cod skins and sweet potato chews are also available from Nature’s Harvest. Visit your local Global Pet Foods to see a full selection of healthy treats from a variety of trusted brands. Obesity is one of the most common health concerns for dogs and cats nationwide. There are many factors that contribute to excess weight gain in pets, but in the end, it comes down to calories in vs calories out, pets eating too much and exercising too little. The most prominent concern with obesity is the numerous health problems for which obesity is a precursor. Orthopedic disease is the biggest risk for overweight canines, whereas diabetes is the biggest risk for overweight felines. In addition to these, obese pets are also at higher risk for urinary tract disease, dermatitis, oral disease, pancreatitis, respiratory complications and renal disease. Preventing obesity by closely monitoring body condition and feeding only as much as is required by the pet is extremely important. Note that feeding directions on pet food packaging is only a guideline and some dogs may require less than the recommended daily amount. Another thing to be aware of is that most household pets do not fit into the “active” or “highly active” category. We must be realistic about the exercise our pets are doing. Exclusively indoor cats do not tend to engage in intense activity. Dogs that go for a couple walks a day and perhaps to obedience or agility class once per week are considered moderately active. We also must be aware of the condition our pets are in. The majority (60-70%) of owners with overweight pets underestimate the body condition score of their pets. This means they score them as less overweight than they really are. Learning how to properly body score and being honest about your pet is imperative to their health. Feeding programs should also be regularly evaluated and adjusted. Pets may become less active as they get older, or during certain times of year, and food should be reduced accordingly. Unfortunately, in many cases, weight gain is not monitored closely enough, and feeding programs are not adjusted regularly. It is therefore important to know how to create an effective weight loss plan. Simply switching to a weight management food is not always the answer. We have to pay close attention to the calories and where they are coming from. Some weight management diets are lower in fat and/or protein but not lower in calories. These diets provide a higher proportion of calories from carbohydrates, which is not beneficial for weight loss. A diet that is higher in protein and fat is advantageous for weight loss. If you would like to learn how to create an effective weight loss plan for you pet, continue reading. Accurately body score the pet and decide how much weight they need to lose. Every increment above “ideal” on the body condition score (BCS) scale accounts for 10-15% additional body weight due to excess fat deposition. Below is the 1-9 Body Condition system. This is the most accurate BCS system. Example: We have a female Rottweiler that weighs 50kg. We assess her body condition and rate her a 7 on the BCS scale (5 is ideal). This means she needs to lose 20-30% of her body weight, which is 10-15kg. Based on her size, we estimate her ideal weight to be 40kg, so she needs to lose 10kg. Catalogue daily food intake and calculate total calories consumed. This includes meals, treats, chews, table scraps and anything else the pet eats. Based on calories consumed and weight loss goal, decide on the level of caloric restriction. Calories can be reduced by 10-40% depending on the weight loss goal. Larger pets and pets with more weight to lose can tolerate more aggressive calorie reductions than small pets with less weight to lose. Example: Our female Rottweiler needs to lose 10kg (20% of BW). She is consuming 4 cups of food (a total of 1620 calories) per day, plus 1 large dental chew (140 calories) per day. She is consuming a total of 1760 calories per day. We decide we want to reduce her caloric intake by 30% since she is a large dog with quite a few kgs to lose. We decide to reduce her food to the recommended amount for a less active 40kg dog, which is 2 ¾ cups according to the guideline on the package. We want to continue giving her one dental chew daily. This brings her calorie intake to a total of 1254 calories per day. This is approximately 29% calorie reduction. We did not need to make any big changes to her diet; she is eating the same food, just less of it. Catalogue daily exercise and decide, based on the ability of the dog and the household, how to implement extra physical activity. Example: We take our female Rottweiler for a 30 to 45-minute walk twice a day and we go to obedience class once per week. She is young, with no mobility restrictions, so we decide to replace one of her walks with a 1-1 ½ hour visit to an off-leash dog park where she can run. Every 2 weeks or so, the plan should be re-evaluated and adjusted if needed. Weight loss should progress at a rate of approximately 1-2% of body weight per week. For larger dogs with more weight to lose, a steep calorie reduction could result in quicker weight loss at the beginning of the program. If at any point in the program there is no weight loss observed for more than 2 weeks, the program should be adjusted by further reducing calories or increasing exercise. Example: We should expect our rottweiler to weigh in at approximately 48-49kg after the first two weeks of the program, and the program should continue for 10-20 weeks until desired body weight is reached. At her first weigh in, she has dropped to 47kg. The program is working, so we continue! After 14 weeks, she weighs in at the goal weight of 40kg. Once ideal body weight is reached, it must be maintained. The weight loss program should be continued after the ideal weight is achieved. If weight loss continues beyond the desired weight goal, calorie intake should be increased slightly until desired weight is maintained. Calories required for maintenance might be slightly higher than were required for weight loss. This maintenance step entails regular monitoring and adjustment. Example: Our rottweiler has reached the goal weight of 40kg. We assess her body condition and are satisfied that she has reached a body condition score of 5 – the ideal score. We continue the same program for two more weeks, and at the next weigh-in, she is still at 40kg, so we will continue the same program to maintain her here. We continue to regularly weigh her and evaluate her body condition and make adjustments whenever necessary. With continued assessment, we should successfully maintain ideal body condition for the rest of her life. 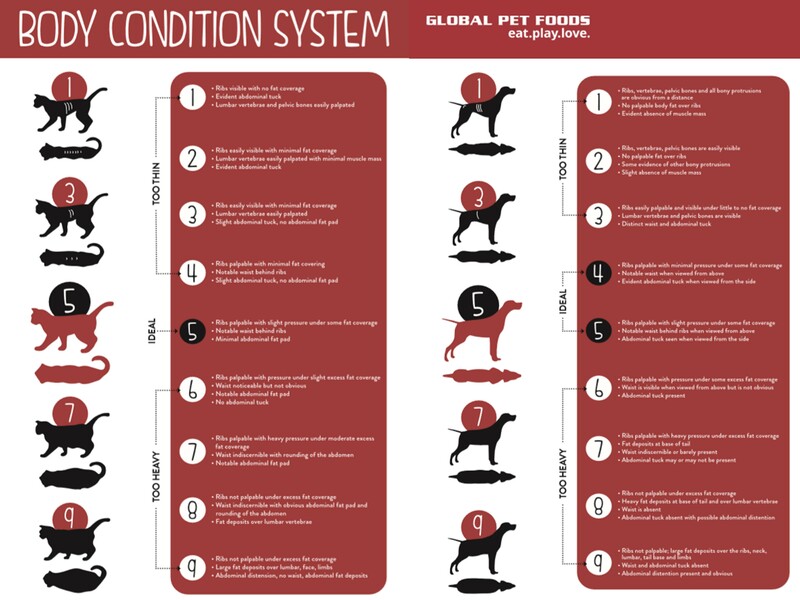 For more information or for assistance creating a weight loss plan for your pet, visit your local Global Pet Foods store or submit a question or comment through our contact page. The winter season presents a variety of challenges for people and pets. Dry skin is something we can all be affected by – two-legged or four-legged. Dryness in the air, whether it be cold winter wind or dry heat indoors, can reduce or eliminate the moisture-locking oil barrier on the surface of the skin. Skin that is most exposed to the air is most vulnerable to losing this protective layer. We, as people, notice it most on our face and hands. For our pets, areas at most risk are dependent on how much hair they have and where it grows! For any dog, the nose is always vulnerable as it is always exposed. Other areas at risk of high exposure are ears and bellies. Paw pads are especially vulnerable in the winter months because they are not only exposed to dry air, but also to ice, cold concrete, salt and rough terrain. Some breeds are more at risk than others. Brachycephalic breeds (dogs with shortened/flattened faces; example, pugs) have difficulty licking their noses due to the anatomy of their face, so they are less able to wet their noses, putting them at even higher risk in dry conditions. Breeds that are short-coated, with more exposed skin on their ears and bellies (example, boxer) may experience dry skin in these areas as well. Finally, hairless breeds are fully exposed and many more areas can be affected. There are a variety of strategies we can implement to prevent or treat dry skin in winter time. Winter apparel can limit the exposure of some areas, but what about the areas that are difficult or not possible to cover up? First and foremost, we must support the skin from the inside-out: with nutrition. It is important to support total nutrient requirements of the body. If some requirements are not met, the body will direct nutrients to essential body functions and may not allocate enough to the skin. This can compromise the health and function of skin. Polyunsaturated Fatty Acids (PUFAs): Essential omega-3 and -6 PUFAs are the most important nutrients for maintaining moisture in the skin. Essential PUFAs are assimilated into epidermal cell membranes and are an integral part of cell structure. They are also components in the extracellular lipid matrix – this is the oil barrier on the surface of the skin, and is directly related to moisture retention and permeability of the skin’s surface by preventing trans-epidermal water loss. Vitamin A: important for cell reproduction and growth. Skin cells are continuously regenerating and it is important to support this process in order for the structural integrity of the skin to be maintained. Vitamin C: strong antioxidant activity; plays a role in collagen production. Preventing oxidative damage and supporting skin structures are important for keeping the skin healthy. Vitamin E: strong antioxidant activity. Vitamin E works alongside vitamin C in the antioxidant complex. Vitamin B5: attracts and binds to water. Used topically on the skin, it can help to lock in moisture. “Complete and Balanced” diets should provide enough of each of these nutrients for maintenance requirements. However, in dry conditions, requirements for some of these nutrients may be elevated beyond normal maintenance levels. Increasing feed rate is one way to increase nutrient intake without changing the balance of vitamins, but excess calories may not be tolerated by some pets. Sometimes supplements can be introduced. The most important and safest supplements to introduce are fatty acid supplements. There is no concern with upsetting the carefully calculated vitamin balance in your dog’s commercial diet like there is with vitamin supplements (if you feel a vitamin supplement might benefit your pet, consult your veterinarian). Omega-3 and omega-6 supplements are readily available for purchase. Fish oil and flax oil are examples of high omega-3 sources; sunflower oil and chicken fat are examples of high omega-6 sources. *A Note on Coconut Oil: Coconut oil is a popular go-to for dry skin but it may not be the solution your pet requires. Coconut oil is DEFICIENT in essential fatty acids and is composed of primarily SATURATED fatty acids, not the beneficial PUFAs, so it is not a good dietary additive to improve or prevent dry skin. It can be used topically to temporarily relieve symptoms of dry skin, but since it is a comedogenic oil (plugs skin pores), it should not be the long-term solution to dry skin. Topical products to consider are those that moisturize and protect the skin without clogging the natural oil ducts. Moisturizing shampoo followed with moisturizing conditioner can be beneficial to the whole body. A soothing oatmeal shampoo and conditioner can be a great start to a moisture-replenishing regimen by cleansing dirt and debris and leaving the skin clean and pH balanced (make sure to only use products that are formulated for pets, since the pH of their skin is different from ours). From this stage, moisturizing and protective products can be applied to treat or prevent dry skin. It is important, however, to limit bathing to once a month. Excessive bathing can end up having an opposite effect to what we desire, by stripping away natural oils, leaving the skin dry and unprotected. Oils such as argan oil, olive oil, jajoba oil, soybean oil, cottonseed oil and many others moisturize and soften skin without clogging pores. Beeswax is a natural substance that seals in moisture and acts as a barrier to cold air without clogging pores in the skin so they can continue to function optimally. It is also antiviral and antibacterial which is especially important for dry, cracked skin that is more vulnerable to infection. Paws are especially at risk during cold weather. Paw pads can become irritated and cracked in the winter not only because of dry air but also due to road salt, cold surfaces and rough/abrasive terrain. The best solution for this challenge is prevention and protection! Some dogs will tolerate boots, which offer the best protection against salt, cold and rough surfaces. However, many dogs strongly dislike the sensation of wearing boots. In these cases, paw balm is a great solution. It creates a barrier on the paw pad surface to protect against winter hazards. Natural combinations of wax and oils protect the surface of pads while allowing perspiration to escape (remember, dogs sweat through the pads of their feet so this is very important to maintain healthy pads and avoid infection). Antiseptic and protective beeswax is a great option for pads as a barrier and to encourage moisture retention as well as healing. Moisturizers can be used short term to help cracked pads heal. Products with high oil content which are intended to soften skin should be avoided as long-term solutions because the function of the pads of the feet relies on toughness, not softness. The softer the pads are, the more vulnerable they are to cuts and abrasions – this is not ideal, especially when traversing frozen winter terrain. Once pads are healed, products intended to maintain moisture and protect the pads are best. No matter what you and your pet like to do in the winter, it is important to give them what they need to be healthy and comfortable. 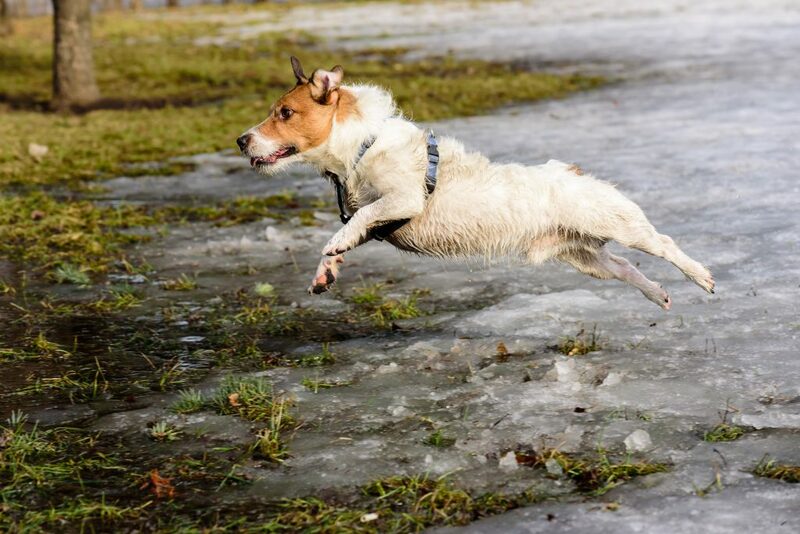 Proper nutrition and protective layers ensure your pet can enjoy any winter activity, whether they are bounding through the snow or tucked in on the couch. GLYCEMIC INDEX is a measure of the relative rate of how fast and how high blood sugar levels rise after a specific carbohydrate is eaten relative to the rate of increase in blood sugar levels if the meal consisted of only the simple sugar glucose. The higher the glycemic index the faster the rise in blood sugar levels and the higher the concentration of sugar in the blood. In contrast the lower the glycemic index the slower the rise in blood sugar levels and the lower the concentration of sugar in the blood. Glycemic indices are rated as high >70, moderate 55-70 and low <55. Diabetes is associated with high blood sugar levels so there is an inference that if the blood sugar levels are kept low it will help to manage diabetes and may help to prevent diabetes from occurring. The management of diabetes is aided by managing blood sugar levels but whether low glycemic index foods prevent diabetes in pets is still unknown. Glycemic indices have been developed for many food ingredients. Foods high in carbohydrates often have high glycemic indices but not always. For example, potatoes can have either a high or low glycemic index depending on the type of potato (cultivar), the preparation method, cooking time and temperature, whether the potato is eaten hot or cold, how the potato is formulated with other ingredients and the size of the meal. Hot mashed potatoes can have a high glycemic index of 70 to 80, while cold cooked potatoes mixed with protein and fats can have a low glycemic index in the range of 30 to 40. GLYCEMIC LOAD: To further complicate the understanding of the effect of various diets on blood sugar levels one also needs to consider glycemic load. It is a mathematical assessment which attempts to predict the actual blood sugar level that will result from a complete meal, not just the individual ingredients. Glycemic load sums the glycemic indices from all of the ingredients together taking into consideration, how they are prepared and how they are served. Glycemic load is a much better predictor of blood sugar levels than simply glycemic index. This table illustrates that the exact same diet formulation can have very different glycemic loads depending on how the diet is formulated and how the diet is served. Glycemic Load is highly dependent on preparation and presentation. Both diets A and B have identical carbohydrate inclusions but diet A has a high glycemic load and diet B has a low glycemic load. Most cats are difficult if not impossible to train to respond to directives. Most dogs take considerably longer to housebreak, and some just never get all the way there. Unlike with Fluffy, housebreaking a pup is usually a hands-on, time intensive project. Cats can be house-trained in an instant as long as they have access to a litter box. There’s really no training to it, in fact. It’s instinct. Dogs are social beings. They want to be with their pack, wherever their pack may be. Cats are solitary by comparison and their primary attachment (when forced to choose) is to their territory rather than other two or four-legged animals. Dogs have 42 teeth. Cats have 30. Cats can jump and climb, giving them more options when they need to hunt for food, or when they feel threatened. Dogs are earthbound, so they need their pack to hunt effectively. And when a threat triggers their fight-or-flight response, they are more likely to react with aggression because their ability to flee from a predator is limited. Dogs are scavenging carnivores, which means although they are primarily meat-eaters, if necessary they can survive on plant material alone (remember, surviving is different than thriving). Cats are obligate or strict carnivores. Cats cannot sustain life without eating meat in some form. Dogs in the wild catch their prey by running it down. They are long distance runners, not sprinters. Cats creep up on their prey and catch it by surprise. They are sprinters, not distance runners. Cats cannot be fasted and should not be dieted down too quickly. Cats don’t efficiently burn fat reserves as an energy source. Instead, without food, their bodies break down non-fatty tissues for energy. This can lead to a life-threatening liver condition called hepatic lipidosis. Dogs are much better at using their fat reserves and can tolerate a lack of food for much longer than cats. Cats have retractable claws that stay sharp because they are protected inside the toes. Dogs claws are always extended and become blunt from constant contact with the ground when they walk. Cats can remember up to 16 hours. A dog’s memory is only about five minutes long. Grain-free pet food is all the rage, trending right up there with human food fads, which include Gluten-Free, Paleo, and the Wheat Belly Diet. Everyone wants to avoid carbohydrates. Is choosing a grain-free pet diet really giving you what we all want, a healthier pet? Certain carbohydrates should be avoided, but some are really beneficial for dogs. Let’s think about spring-cleaning our pets’ bodies with that fabulous carbohydrate: fibre! Some commercial dry pet foods contain up to 70% carbohydrates even though dogs can make their own carbohydrates out of protein and fats. Even canned pet food usually contains carbohydrates to reduce the ‘free water’ in the can (so that it feels more solid when you shake it). The main reason for this is cost. Plant-based carbs are less expensive and more readily available energy sources than proteins and fats. The starchy carbs used to add structure and texture to kibble creates a shelf-stable product, making it possible to ship it all over the world. The cost benefit flows to you, the consumers too. Cheaply made, inexpensive pet food has become the norm, creating an industry, and a lot of spoiled consumers who balk at paying the true cost of a healthy diet for their pets. Simple carbohydrates include sugars – sucrose, lactose, fructose – that break down quickly and are readily absorbed in the small intestine and converted into glucose. This is the basic nutrient required by all the organs of the body for its energy needs. Simple sugars are found in fruit, honey and sugar cane, for example. They’re tasty, but as we all know, too much is unhealthy, and can be deadly. Complex carbohydrate may be further categorized into Starches and Fibre. Starches take more time to break down, requiring enzymes from the pancreas and intestinal wall before they can be absorbed and utilized. These carbs are the ones most often used in pet food. Starches come from the cell walls of a variety of plants including (a) grains, especially wheat, rice, corn, barley and oats; (b) vegetables such as potatoes, sweet potatoes and peas, and (c) beans including tapioca and soy. A whole range of foods contain starches, with some breaking down quickly into glucose (watermelon) and some more slowly (pumpkin). How quickly the starch breaks down and is absorbed into the bloodstream is what gives a carb its Glycemic Index (GI). Several factors influence a food’s GI including whether and how it is processed, ripeness (for fruit), how much the food is chewed and how quickly it is swallowed, and the fibre, acid and fat content. Foods with a high GI can potentially flood the bloodstream with glucose, raising the blood sugar level in the animal, wreaking havoc on the pancreas as it tries to keep up with producing insulin, the hormone required to resorb that glucose from the blood into the tissues and organs that need it. Eating a diet high in these kinds of starches and simple sugars (think breakfast cereal) is the basis for many chronic diseases which stem from the digestive system working so hard to absorb, digest, store and eliminate the products of all that glucose: diabetes, heart disease, inflamed bowel, obesity, and liver disease. The other category of complex carbs is Fibre, and it’s the saving grace in any argument in favor of feeding carbohydrates to dogs. Actually an ‘empty’ carb because it offers few actual nutrients, it provides amazing service instead. Fiber types are either soluble or insoluble. It forms a gel when mixed with liquid, binding with fatty acids, which in humans is especially helpful for lowering cholesterol. It helps prolong stomach emptying time, which slows the release of sugars, preventing large glucose and insulin spikes for diabetic dogs. Fibre is invaluable for regulating the transit time of the bowels. It will absorb water, helping to relieve diarrhea, and because it holds water, it also relieves constipation. It exits the body in pretty much the same shape as it entered, since it does not dissolve in water. Most complex carbohydrate sources will contain some insoluble fiber, the most common for pet foods being vegetable peels, beet pulp, peanut and soybean hulls, bran, cellulose and apple pectin. This fibre increases bulk in the colon, passing through like a bottlebrush, collecting toxic debris along the way. And fibre helps dogs feel full, which is really helpful for maintaining healthy weight. Fibre quality makes a difference since some are fermented by intestinal microbes (bacteria) in the gut, affecting the water-holding capacity and bulk of the stool. For instance, slowly fermenting fibres (cellulose, peanut hulls) maintain their structure longer and thus hold more water, making them the better choice ingredient for a dog tending toward diarrhea. Rapidly fermenting fiber (apple pectin, soy) can produce a laxative effect. The over-use of cheap processed grain in pet food is one of the reasons for the epidemic of diabetes we have now among our pets. Feeding a diet high in good quality fibre can help control the swings in blood sugar that accompany this chronic disease by slowing digestion and absorption of starches. Whole grains that contain the bran, germ and endosperm of the grain kernel, which break down more slowly due to their outer fibrous hull, are therefore a quality carbohydrate for animals, especially those with blood sugar issues. Brown rice will have a very different effect on your dog than milled corn, for example, which has been stripped not only of its fibre but of its minerals too, especially B-vitamins. Fibre is only found in plant foods, especially grains and seeds. Flora4 Ground Sprouted Seed mix contains a combination of soluble and insoluble fibre that performs beautifully as a 100% natural aid for diarrhea, constipation, and gas. Ignore the fads. A carefully selected diet containing whole food ingredients, including whole grains is a budget-friendly dietary choice benefitting your pet’s health that provides excellent nutrition per kilocalorie. And with all that fibre it will have your pooch’s insides clean as a whistle this spring. Natural probiotics to the rescue! First of all, what are probiotics, anyway? Everyone knows they help optimize our gut flora (the bacteria occurring naturally in the intestine), but really, what are these things? Where do they come from? Probiotics are living microbes which have a beneficial effect on the host animal by contributing to its intestinal microbial balance. Acidophilus and bifidobacteria are the most common types of microbes used as probiotics, but there are over 30,000 species of microbes that interact to maintain a healthy intestinal environment! Probiotics tip the balance in the gut toward friendly bacteria and away from pathogenic bacteria which can cause gas, bloating, pain, diarrhea, skin and coat problems and other illness. They’re great for helping dogs and cats recover from most digestive disturbances, both chronic and acute. Although there are lots of commercial products on the market in pill and liquid form for high retail prices, probiotics are naturally found in foods such as fermented vegetables (sauerkraut, and kimchee) and sprouted seeds, for example. These are proven to be, by far, much more effective than the lab-made strains available in bottles. Why? Because science cannot imitate the naturally complex relationships of all of the species of microbes that interact in the gut to maintain a healthy intestinal environment. Neither has science yet discovered all the ways the body interacts with each of these species to produce the beneficial effect. But most importantly, recent research shows that if the probiotic microorganisms are allowed to establish their own symbiotic environment prior to being ingested by the host body, they are ‘hardier’, more able to re-establish their dominance, more able to withstand the heat and acid environment of the gut. And finally, commercial probiotics are created by isolating individual strains of microorganisms which are then artificially stimulated to reproduce in a laboratory. In the final product, the selected probiotics have been separated from their intrinsic supporting microbes that were present in the original natural state. These supporting microbes are critical to the survival of the selected strain, so the absorption and use of the finished probiotic by the body will be greatly and significantly reduced. This means that when a native probiotic found in food is ingested while still in its natural host environment it remains supported by the full range of original microorganisms that allow it to function. It will stay healthy, viable and be much more bio-available for absorption within the animal’s intestine. Now that’s something to toot about! Why do dogs get so itchy especially in the winter? Your animals’ skin is always sloughing off and renewing itself, just like our own. Have you noticed however, that as soon as we turn on the furnace in the fall our skin gets drier, and both you and your pets start to scratch and itch more frequently? You can apply creams and lotions but relief does not last as these external measures don’t cure dry flaky skin. Don’t despair! You can get to the root of this problem with some preventative measurements and proper nutrition which are noted at the end of this article. But first, let’s get educated about that amazing organ protecting our insides: SKIN. Skin becomes dry, flaky and itchy due to a number of factors, including: (1) old skin failing to slough properly (sometimes it just needs to be brushed); (2) underlying chronic illness including diabetes or hypothyroidism; (3) poor diet denying skin cells the nutrients required to replace themselves properly; or (4) environmental stress. ‘Winter itch’ is likely the result of a combination of factors, none of them dangerous, but all of them annoying. The outermost layer, called the epidermis, makes the skin impermeable and protects the body from bacterial invasion and other environmental assaults. Also called the stratum corneum, the epidermis is composed of 3 major components that together create a physical wall enclosing the entire surface of the body, protecting it and preventing moisture loss. Flattened, dead skin cells mainly composed of keratin plus other compounds called natural moisturizing factors (NMFs). Keratin is a humectant (which means it holds water) that gives skin its strength. NMFs are also humectants that not only hold water but also attract it. So because they are also water-soluble, the skin dries out if you shower or swim too long or wash your hands too much. The proteins that hold the corneocytes together. Fats comprised of ceramides, free fatty acids and cholesterol. In the stratum corneum, their role is to prevent the loss of NMFs from within the corneocytes. These lipids have another super important function: they combine with sweat to form the crucial thin layer of ‘acid mantle’—the chemical barrier that kills bacteria and regulates moisture loss. Lipids also lubricate the skin and are a major factor in giving it a smooth texture. For the stratum corneum to properly protect the body, it must be elastic and flexible, which is only possible when the skin is properly hydrated to between 20-35%. Each day, it loses approximately one pint of water through trans epidermal water loss, the continuous process by which water leaves the body and enters the atmosphere via evaporation. However, when humidity drops, as it does in cold-weather months, there’s a dramatic increase in trans epidermal water loss as the dry air pulls moisture from the skin. When the skin’s water content drops below 10%, it begins drying out, causing itchiness and flakiness. With less water in the skin, the production of NMFs becomes impaired and lipid levels fall, setting in motion a vicious cycle that is hard to remedy. With less water and fewer lipids to lubricate and protect it, the skin no longer exfoliates properly, resulting in a buildup of dead cells on the skin’s surface, making it look flaky. Dry flaky skin can no longer properly heal itself, resulting in destruction of the protective acid mantle, which then leads to infections…and round and round it goes. Give your animal fewer baths, and reduce water temperatures during winter. This is an essential step for those with dry skin, but should be followed for pets with healthy skin, as well. As mentioned previously, water leaches NMFs from the skin and affects its lipid content. Make sure your animal drinks enough water and has a clean full bowl at all times. Avoid the use of harsh soaps and detergents. These ingredients remove the skin’s acid mantle, thus increasing the rate of trans epidermal water loss. Use alcohol-free glycerin soaps. Use a cool-mist humidifier in the home to maintain proper humidity levels. This will help skin maintain hydration by slowing the rate of trans epidermal water loss. To ensure the body has a ready supply of those all-important Intercellular lipids that give the skin smoothness, restores the acid mantle and promotes proper exfoliation, it is crucial to feed good quality FATS to your animal. This means foods naturally high in ‘good fats’ including the kind found in avocado, clean meats, eggs, fish and sprouted flax. The sprouted seeds mix in Flora4 Ground Sprouted Seeds is rich in Alpha-linolenic acid (ALA). ALA is a type of Omega 3 fat found in plant foods which cannot be manufactured by the body. Once consumed, ALAs can be converted into eicosapentaenoic acid (EPA) and docosahexaenoic acid (DHA) – the kind of fat that creates those critical intercellular lipids. A scoop per day of Flora4 mixed into your animal’s food, whether you are feeding Carna4, a Raw Foods diet, or anything else –will make a huge difference in relieving and preventing itchy dry skin all year round. Try some for yourself too –Flora4 is 100% organic human-grade food, so don’t hesitate to put some in your own yogurt on those cold winter mornings when you’re feeling a little itchy. With the summer coming up, we are often hit with wanderlust. That impulse to travel. To experience things from the open road and to soak in all the adventures that we can. So, pack a few things, put a bandana on Sparky and hit the trail, what could be more simple? Yes, it all sounds great until reality hits. Taking a road trip takes planning and organizing for the whole family. Adding Sparky to the mix is a great idea, but keeping him in mind when preparing is a necessity. Let’s take a look at the big picture. You will be traveling by car, stopping at hotels or campgrounds, eating along the way and taking in the sights. Safety first, make sure Sparky is secured properly in the car. A seat belt designed especially for dogs is a great idea and you can pick one up prior to the start of your trip. A lot of dogs feel safe traveling in their crate and this might be an option depending on the space you have. Packing for your pooch is like packing for the kids. Make sure you have a supply of water and a non-spill dish. Make sure you bring some dog snacks and toys. There are a variety of stuff-able toys in your local Global Pet Foods store, which can have treats put into them. This will provide some entertainment for your dog, and keep him settled for a while. One reminder, make sure you pack all food, human and canine, in sealed packages. You don’t want to stop for a bathroom break and notice Sparky sitting on the back seat with his face covered in donut crumbs! Another important point to keep in mind is that it may be difficult to stop for food. You might think that going into one of the rest stops on the highway will suffice, but I have found the line-ups to be very long in a lot of cases. An alternative to this is to use only drive-thru restaurants, or to pack a picnic lunch. It is also a good idea to pack a expandable leash. At home your dog might not stray far, but out in nature…well, nature may call. Your dog might catch a scent he wants to follow or even seek out his own adventure. Best to leash him in unknown areas, for everyone’s sake. Once you arrive at your destination it is time to get settled. If you are planning on staying at hotels along your route, you should have reservations made in advance. Make sure it is a pet friendly establishment. Even if your dog is the quietest, best-behaved dog that you have ever met, still bring his crate into the room. If you intend on going out and leaving your dog in the room, he should be crated during that time. If you know you live with a barker, or a dog that might bark when he hears people outside the door, then please don’t leave him alone. It is unfair to the other patrons. Again, his chew toy stuffed with his favorite treats will help to keep his mind off activities going on around him. A few more things to keep in mind. These days we carry cell phones so make sure that is the number on your dogs tag. Most of our dogs have microchips, but it is important for your dog to also have immediate contact info right on his collar. If the dog has to go to a shelter or Vet clinic to be scanned for his microchip, it might be a few days before you re-connect with your dog. Also remember to research where the Veterinarians are along your route and take any paperwork with you that might be important in an emergency. If your pet has a prescription, take a script in case the medication ends up at the bottom of the lake during a canoe capsize. Your first aid kit should include enough bandage material to take care of a cut paw and even some canine bug spray that you’ll find at your local Global Pet Foods store. If you’re heading to the US, make sure you check with the border beforehand, so you have the paperwork you need to cross. A road trip with Sparky can provide hours of fun and memories. Get prepared, take lots of pictures, and journey in peace.